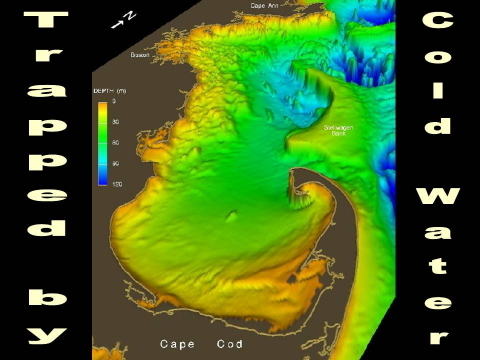 The hook of Cape Cod, an accident of geology and the receding Laurentide glacier 15,000 to 20,000 years ago, has become a lethal trap for marine megafauna: whales, dolphins, porpoises and especially critically endangered sea turtles. Juvenile tropical and semi-tropical sea turtles sow their wild oats by surfing the great ocean currents during their early years, a one-time rite of passage before settling down into a more stable, safer and predictable maturity. 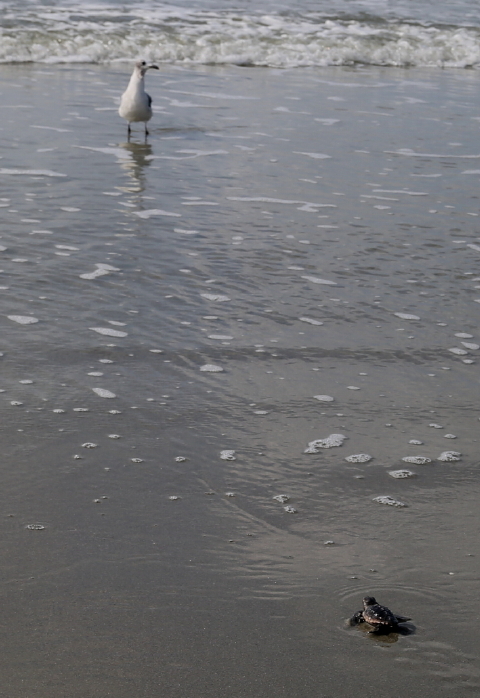 These youthful adventures lead many a young turtle astray, as they summer in seductive Cape Cod Bay. For the most endangered of sea turtles, the Kemp’s ridleys, many begin life as hatchlings in Rancho Nuevo, Mexico and some in nearby Texas beaches. They slip into the sea and catch an adventurous ride on the Gulf gyre, living in camouflaged safety among sargassum mats within a community of other tiny critters that offer plentiful food for little sea turtle hatchlings. 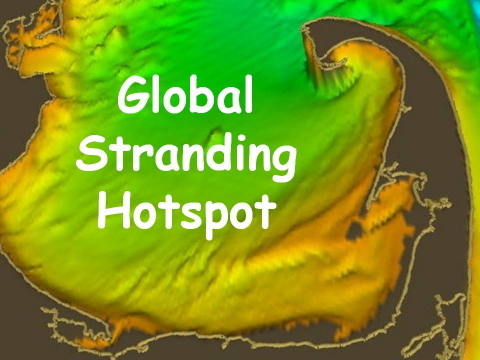 Currents carry the mats and hatchling riders into the Gulf Stream moving them slowly up the Atlantic coastline. Around two-to-three years old, turtles get a bit too large to flourish in this floating habitat and begin to transition to a benthic environment. Following the immortal words of Horace Greeley, they head west from the Gulf Stream and hit the Atlantic Coast of the Eastern seaboard. Depending on many complex factors, but most especially water temperature, varying percentages of these youthful adventurers hit the Atlantic coastline north of Cape Cod Bay. As water temperature cues turtles to head south, they swim along the coastline toward their semi-tropical home. At Provincetown, at the tip of Cape Cod, a fateful decision is made: whether to turn left and continue the journey southward along the coast, or whether to turn right into the warmer, shallower, richer waters of Cape Cod Bay. Those who choose the bay are now in a race for survival against an impending winter that they cannot possibly win without massive human intervention. In the Great White North of Cape Cod, sea turtle stranding season arrives each year as frost begins to form on pumpkins. Juvenile tropical and semi-tropical sea turtles linger in Cape Cod Bay as summer turns to fall. Water temperatures dip and they’re cued once again to head south to warmerclimes. Unfortunately, these turtles have waited too long and have become trapped in the bay as Atlantic Ocean temperature has dropped more quickly and has reached levels where turtles cannot function or survive. 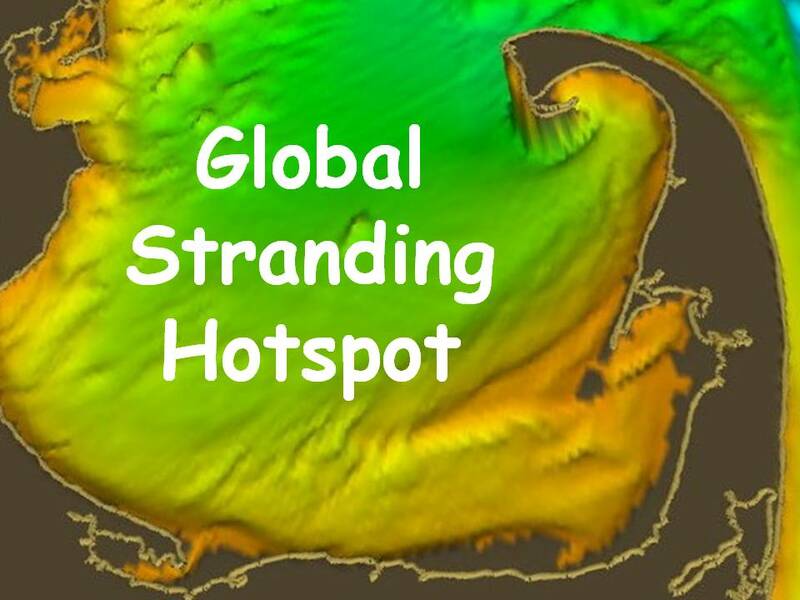 They face a wall of cold ocean water that locks them into Cape Cod Bay with no escape. 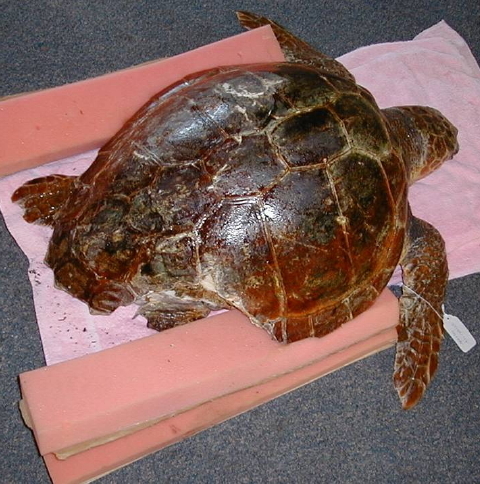 Soon bay water, too, reaches critical temperatures and these turtles become cold-stunned and eventually strand on bayside beaches, usually beginning in early November. The magic temperature is 50 degrees Fahrenheit. Once that threshold is breached, sea turtles enter into stupor, gurgle to the bottom and are tossed around the bay like flotsam and jetsam by winds and currents. Sustained winds drive them ashore at high tide on beaches located in the opposite direction of the wind flow. Because these cold-stunned turtles are in complete stupor, the rules of physics rather than biology guide the progression of the stranding season. 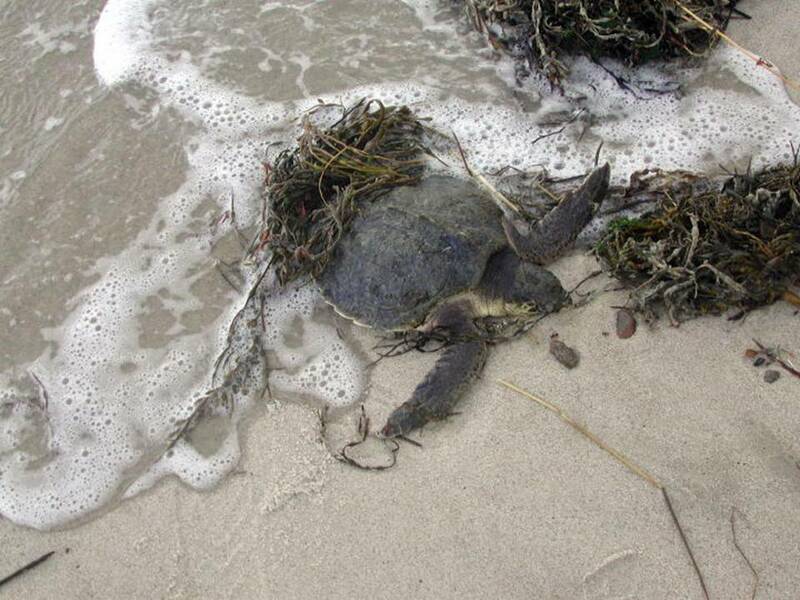 Smaller, less massive turtles are more quickly chilled and are blown ashore earlier than larger, more massive ones. So, the lightest turtles (Kemp’s ridleys) strand first, proceeding through the season to heaviest turtles (loggerheads) in December. Significant strandings normally coincide with the first sustained storm event of late October or early November, crescendo until mid to late November, and then gradually decrease until the end of December. Each year brings surprises, but the trend normally resembles a bell shaped curve with the peak rising in the late November period. The percentage of survivorship is highest at the beginning of the stranding season and drops significantly once icy slush forms along the shoreline. 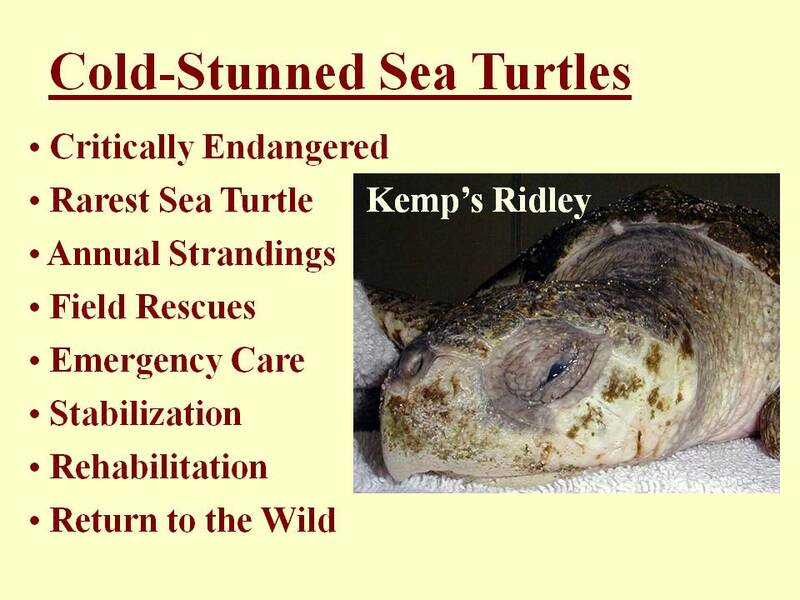 Our most frequently cold-stunned sea turtle also happens to be the world’s rarest sea turtle, the critically endangered Kemp’s ridley. 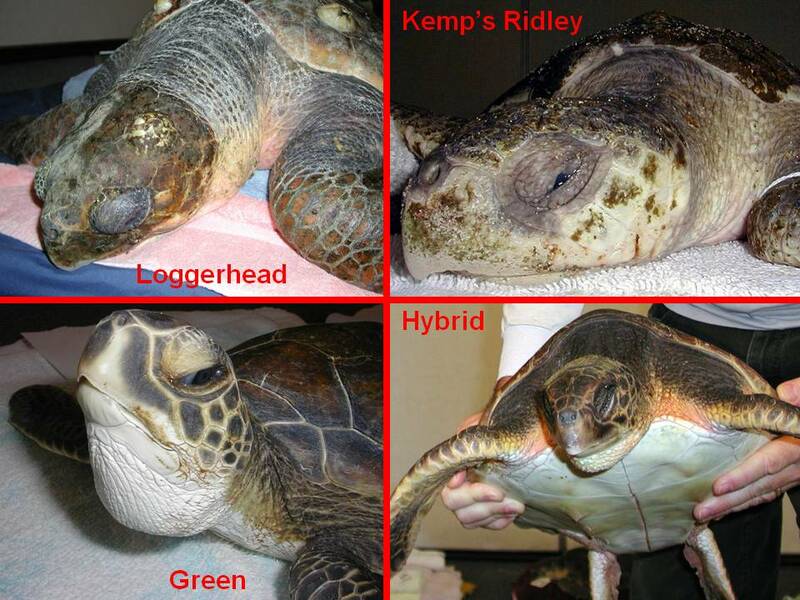 We rescue mostly two-to- three year old juveniles that represent more than 90% of our sea turtle strandings each year. The next most frequent strander has been the loggerhead, also juveniles in the two-to-five year old bracket. These animals are much more massive and tend to come ashore later in the stranding season. Over the decade of the 00’s, numbers of cold-stunned loggerheads dropped precipitously, which concerned us as an indicator reflecting a drop in the overall population numbers of this very America sea turtle. 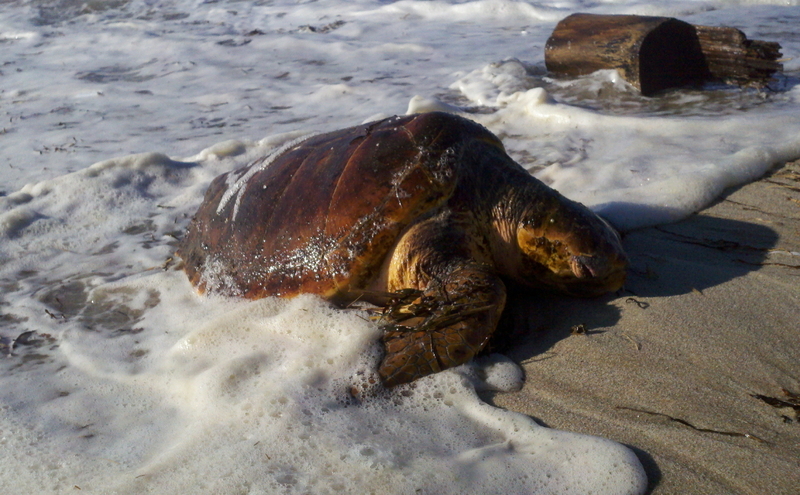 Recently, we have begun to see a rise in loggerhead strandings once again. In early years, green sea turtles were rare stranders. Yet, within the last decade, greens have rivaled loggerheads for the second most frequent stranded turtle. They are absolutely gorgeous animals. We have seen a few hybrids in the last decade, mixtures of loggerheads, greens and hawksbills. There were only a couple of isolated hawksbill turtles that we have seen over the last few decades. In the early years, 1970s and 1980s, only a few sea turtles each fall would strand with totals in the single or low double digits. 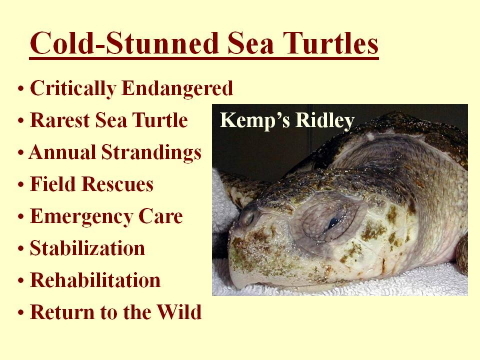 Those totals rose significantly through the 1990s leading to a record stranding season in 1999 with nearly 300 sea turtles, mostly Kemp’s ridleys. Plotting the smoothed trend lines of hatchlings released from Rancho Nuevo and of ridley strandings offset by two years demonstrates an interesting correlation, which suggests that a key vector in increased strandings is the increased number of protected nests and hatchlings being released. In essence, these stranding records portend good news for the species. 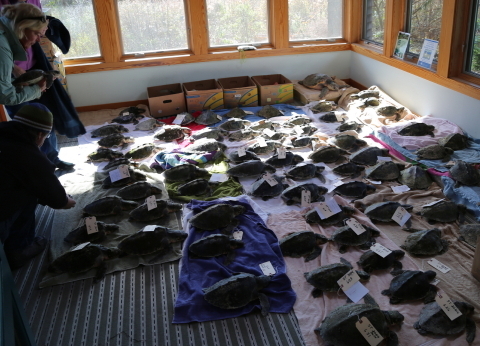 Stranding numbers bounce up and down annually, with the trend pointing ever higher until the dam broke in 2014 with over 1200 cold-stunned sea turtles stranding in Cape Cod Bay. For Cape Cod folks, however, sea turtle strandings are an important challenge to save as many of these endangered turtles as possible. After all, they have avoided the risks and the lethal dangers of hatchlings and juveniles that claim as many as 999 out of a 1000. 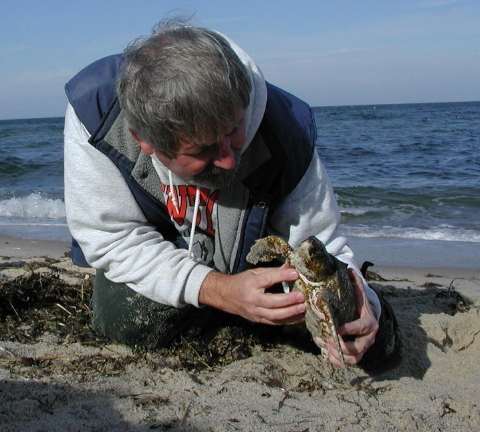 If they can survive the cold-stunned stranding in Cape Cod Bay, their lifetime survival to propagation of the next generation is nearly 100% assured. Saving these turtles has a most meaningful and enormous impact on the recovery of sea turtle populations. The first phase of this process is RESCUE. Turtles with systems shut down and in deep stupor are pushed ashore by winds and current at each fall and winter high tide. Hundreds of volunteers, dressed for warmth in layer upon layer, walk mile after mile of storm-tossed beach at every high tide from late October to late December to rescue sea turtles deposited on the high tide wrack line before they succumb to hypothermia. This massive and critical effort is organized by Bob Prescott, director of Mass Audubon’s Wellfleet Bay Wildlife Sanctuary. Bob discovered the phenomenon of cold-stunned sea turtle strandings and was the first to recognize its significance in the 1970s. On the coastline of Cape Cod Bay, two high tides a day must be covered, come rain, snow, sleet or nor’easter. And at this latitude, at least one and often both high tides occur in the dark of night. A storm-tossed beach can be a dangerous place for rescuers in the pitch black darkness. Flood tides accompanied by on-shore winds drive mountainous breakers onto the remaining sliver of beach. Sea walls and slippery rock jetties obstruct passage. The glare of flashlight on seaweed strewn wrack plays mind games, morphing piles of sea grass into patterns that may or may not represent a stranded animal. Gusts of wind breathe life into debris that rises like a distressed seal, and then deflates to become an abandoned buoy once again. It’s a mind trick your brain plays to keep adrenaline levels high to ensure peak attention and focus. Otherwise your thoughts would drift and your senses would be overwhelmed by pounding surf, howling winds, and miles and miles and miles of mind-numbing darkness. These mental gymnastics keep senses sharp and ready for immediate action when that clump of seaweed, shaped like a turtle, really is a stranded sea turtle in desperate need of rescue. “A night not fit for man nor beast,” as W.C. Fields might say, with winds howling from the west- northwest at a steady 25-to-30 knots, punctuated by an occasional 50 mph gust. 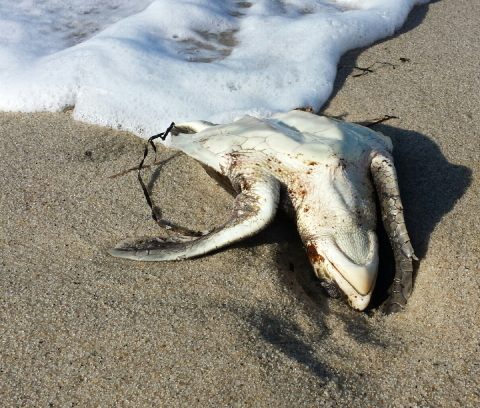 Unfortunately, these are the very conditions in which tropical sea turtles strand each fall on bayside beaches. So, on this November night not fit for human or reptile, turtles would be tossed ashore like flotsam and jetsam, condemned to certain hypothermic death unless rescued from the beach by a dedicated team of staff and volunteers. What during daylight seems a ”walk on the beach” transforms at night into a dangerous obstacle course exacerbated by blinding darkness, pounding surf, scouring sandblasts and deafening winds. On this night, because of a west-northwest wind, we patrolled bayside beaches from Eastham through Orleans and Brewster to Dennis; that is, beaches in the reciprocal direction of the prevailing wind. Our team, consisting of past MME president Sue Wieber Nourse, myself and our son, Jared Nourse, drew the westernmost stretch from Chapin Beach to Sea Street in Dennis. As rescue nights go, this one rated a 10 with a waxing gibbous moon on high and the Constellation Orion rising in the eastern sky. Heck, it wasn’t snowing; not even raining! 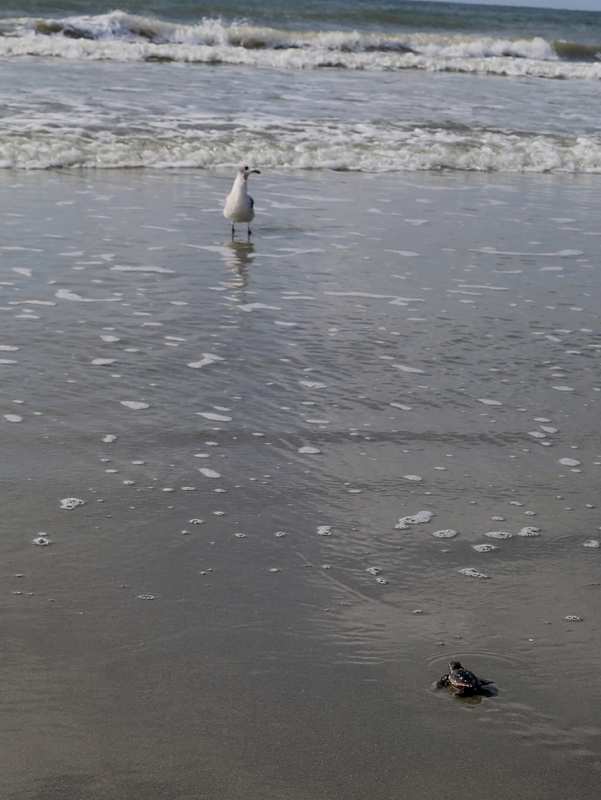 Wieber Nourse found a juvenile Kemp’s ridley sea turtle rolling in the waves. She charged into the freezing water to recover the animal. Measuring a mere 10-inch carapace (top shell) length, the turtle was tossed upside down. “It looked just like salty brine foam in the moonlight,” observed Ms. Nourse. She plucked the turtle from receding waves before it could be pulled back out to sea and examined it carefully. She pronounced it “quite lively” – a perfect candidate for rehabilitation and release back into the wild. Since Sue had to walk the animal back into the teeth of the blow, she placed the little turtle under her top coat to protect it from the blasting wind. Back at the rescue vehicle, the protected ridley was doing just fine (thank you) while Sue’s exposed eyes were tearing in relentless wind punctuated by sand pellets. This year’s record smashing 2014 season proved like no other. While normally volunteer beach patrollers might walk miles of beach year after year, and rarely find a sea turtle, this year stranded turtles became more frequent than Cape Cod clam shells. Beach from Fisher Landing in Truro to Duck Harbor in Wellfleet. We know this section of beach very well, have patrolled it for 15 years and generally expect to find one or perhaps two cold-stunned turtles during the most intense stranding period. A ferocious west-northwest wind churned powerful breakers and tossed cold-stunned Kemp’s ridley and green sea turtles onto the wrack line. 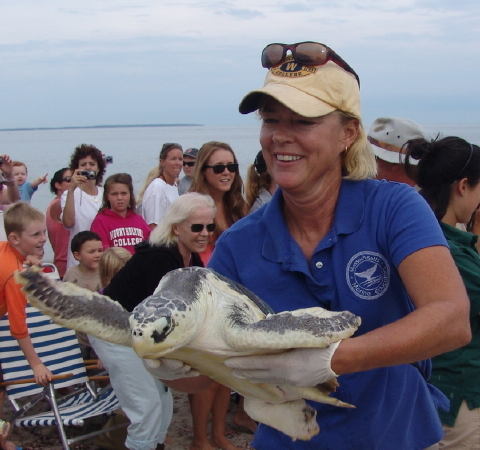 Sue rescued nine Kemp’s ridley sea turtles on the southern stretch of this patrol; at one time, recovering five lively Kemp’s within a short stretch of beach near Bound Brook Island. From the north section of the patrol, I recovered seven Kemp’s ridley sea turtles and two greens. 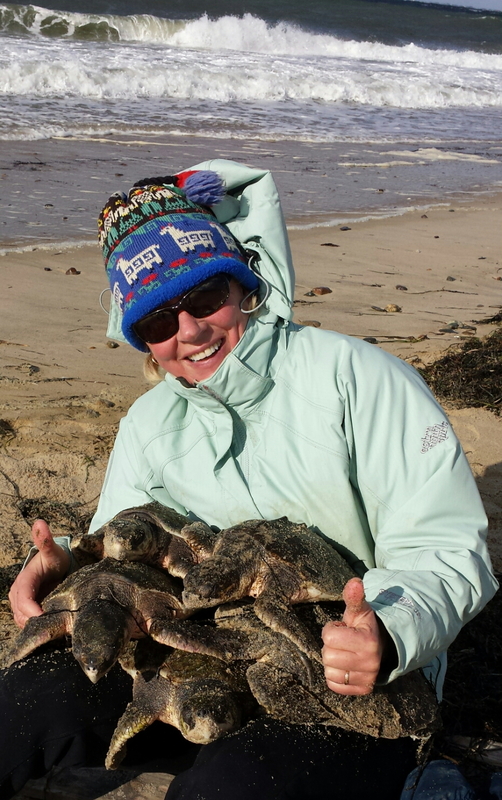 We had never rescued 18 cold- stunned sea turtles in such a short stretch of beach on a single tide … ever. Other teams all along the Cape Cod Bay coastline had similar results. 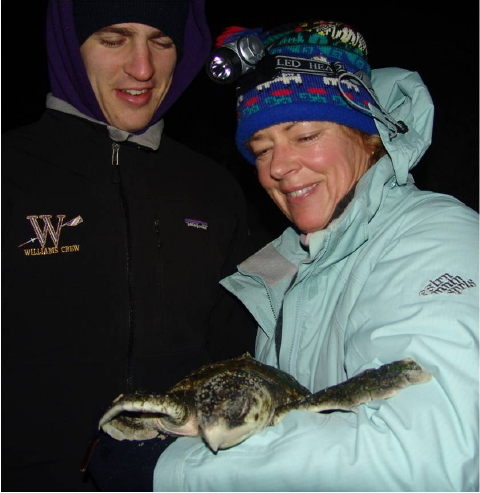 When all turtles had been returned to Wellfleet Bay Wildlife Sanctuary for triage, the 500th cold-stunned sea turtle of the season had been rescued from a windy, freezing Cape Cod Bay. Yet, the intensity of this unusual season did not relent, and more than 1200 sea turtles were recovered from bayside beaches in November and December, more than four times greater than the previous record season. Although absolutely essential, beach rescue is only the first phase of the recovery process. Once taken from the beach, each turtle is examined, measured and weighed for scientific purposes at Wellfleet Bay. It is assessed and triaged. The next phase starts with a long volunteer “ambulance” drive to the New England Aquarium facility in Quincy for intensive medical care by veterinary experts. After the animal is medically stabilized the long recovery process called rehabilitation begins. Facilities and aquaria throughout the United States volunteer tank space and care specialists to handle hundreds of turtles during this phase which can last many months to a year before they’re release back into the wild. In the end, the goal is to release all stranded turtles back into the wild to restore these endangered populations. In the last 35 years, several thousand critically endangered sea turtles, who would have succumbed to hypothermia in Cape Cod Bay, have returned to the wild thanks to this enormous, almost exclusively volunteer effort. 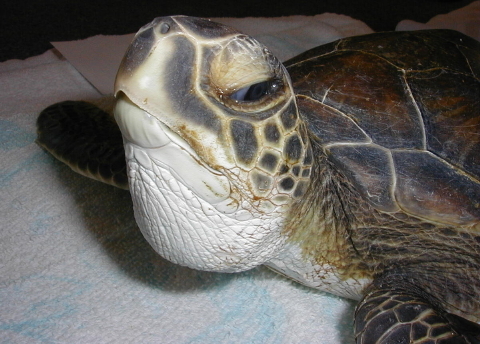 How Can I Help Save Cold-Stunned Sea Turtles? 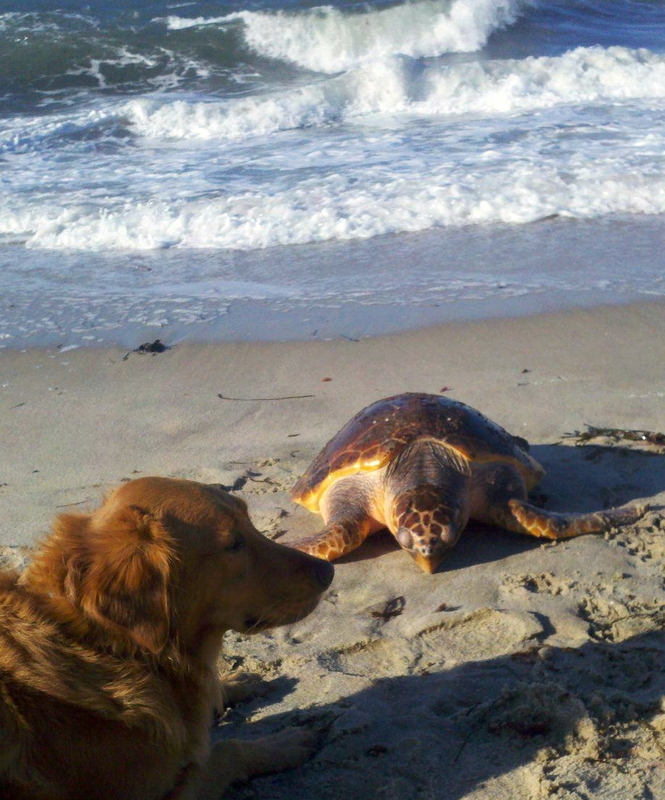 If you encounter a cold-stunned sea turtle on the beach, first DO NOT put it back into the water. Doing so will condemn the animal to almost certain death. DO NOT remove the animal from the beach. A special license is required to transport federally protected species. Instead, DO move the turtle above the high water line. DO cover the animal with dry seaweed to prevent the wind from causing additional hypothermia. 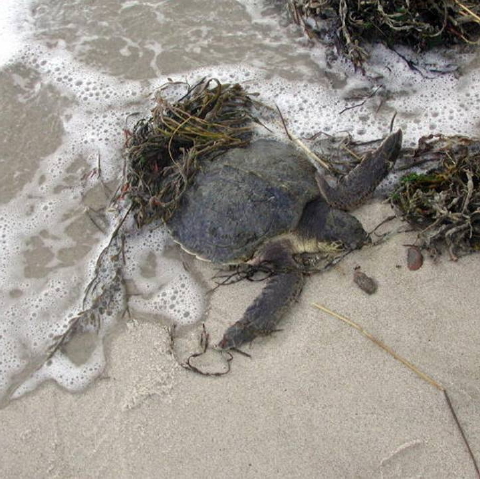 DO mark the covered turtle with a gaudy piece of flotsam or jetsam, perhaps a buoy or anything unusual … so that rescuers can easily find the critter hidden under a pile of seaweed. 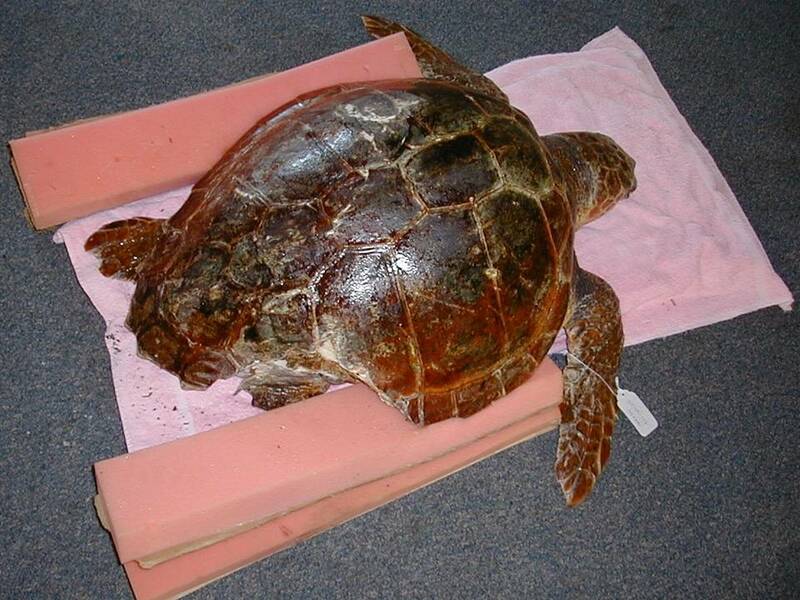 DO call Mass Audubon’s Wellfleet Bay Wildlife Sanctuary at (508) 349-2615 to report the turtle. If there is difficulty getting through to this number, you can always reach our turtle rescue hotline (508-274-5108). When giving directions from the landing or beach to the turtle, DO use left and right (when facing the water) rather than cardinal directions. DO give the walking time it takes to reach the turtle from the landing (“Turn right and walk five minutes”) rather than describing distance in feet, yards or fractions of miles. 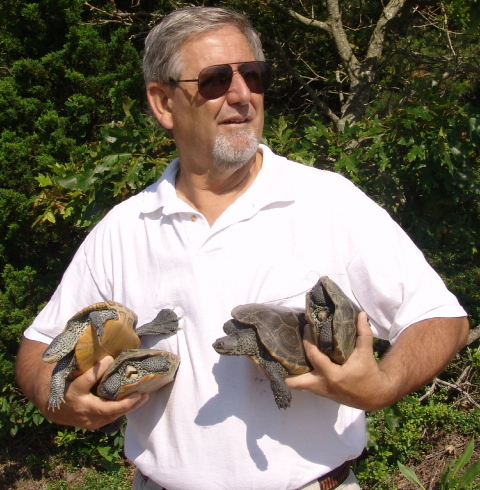 For nearly two decades, Don Lewis and Sue Wieber Nourse, his partner and wife, have spent countless hours on the beaches of Cape Cod and Southeast Massachusetts “saving the world one turtle at a time.” They are co-founders of Turtle Journal and have served as board members of the Massachusetts Marine Educators Association. Sue Wieber Nourse is a past president of MA MME. Their intrepid companion, Rufus the Turtle Dog, is a full partner in turtle research, rescue and conservation. Their exploits have been featured on CNN, ABC, independent broadcasts, books, magazines and newspapers around the nation and across the globe. This entry was posted on Friday, March 20th, 2015 at 4:24 pm	and is filed under Marine Science, Turtles. You can follow any responses to this entry through the RSS 2.0 feed. Both comments and pings are currently closed.